Is your aadhaar card address is wrong or want to update? You can do this online without visiting aadhar center. For your information UIDAI has provided online platform to update your aadhar details like mobile number, name, DOB and address. If your aadhar details mentioned above not correct or you want to update it, you can visit online correction portal and follow the process. In this article we will Change/correct/update our Aadhaar card address online. Before you turn on your PC, first let me tell you that you have to keep a scanned copy of any document associated with the address proof. As a address proof you can use ration card, light bill, passport, driving license, bank passbook, tax bill. So keep ready any one from these document. We have to upload the scanned address proof copy while updating the online address, so keep scanned copy ready. You can also use your smartphone camera to capture better quality image of your document and upload it. Now new tab will be open in browser. 4 Next screen, enter your 12-digit Aadhaar number, text verification number and click on Send OTP. 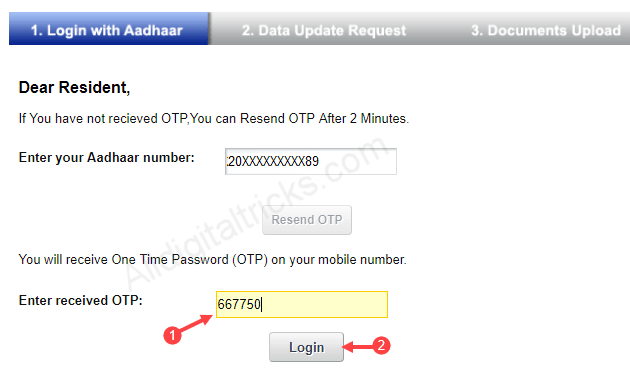 As soon as you click on Send OTP, you will receive OTP password on your registered mobile number. Now enter OTP and click on Login. 5 After logging in you can see different updating options like name, gender, email, DOB, address etc. You have to select “Address” option and click on submit. 6 In next screen enter your correct/updated address without any mistake. After entering correct address, click on submit update Request. Next screen confirm your update request, click on proceed. 7 Next page you have to upload address proof scanned copy. In the address list documents, select any and upload scanned copy of selected document. After upload scanned document, click on submit. 8: Now in last step you have to select BPO Service provider, you can select any service provider so don’t confuse. After selecting BPO click on submit. Done! your application for change/update Aadhaar card address has been successfully sent. You can see your URN number on-screen. With this number you can track your application status. When your Details will be updated? Normally it takes 10-15 days to fulfill your request. Once your address is updated you can download your Updated Aadhaar card online and take printout. 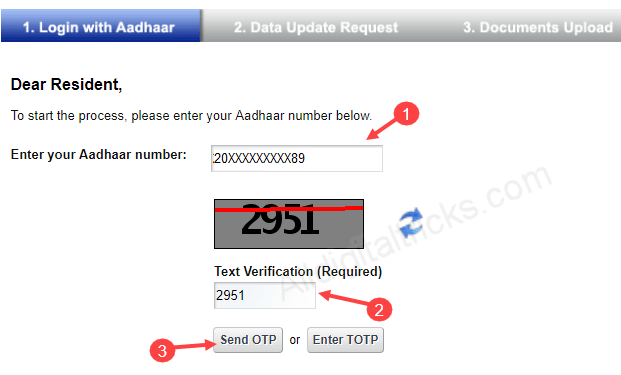 So this is the simple and easy procedure to change/update your Aadhaar card address details. Same, you can update your other details too, just select any detail and upload related scanned copy and submit the request. 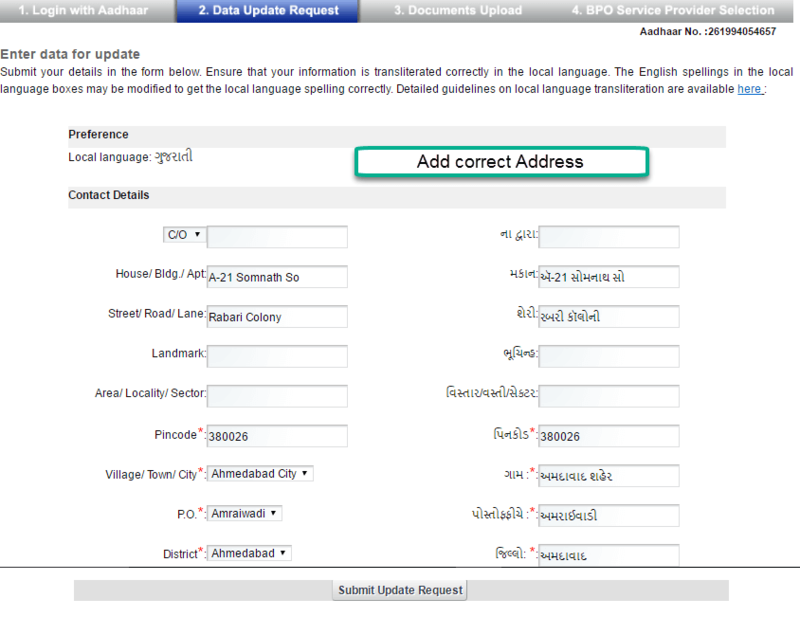 I can only find address field but i need to change mobile number. how to do it? Mobile number change option also available, i think you have not registered your mobile number. But i had received the otp on mobile using which i logged in. I checked. 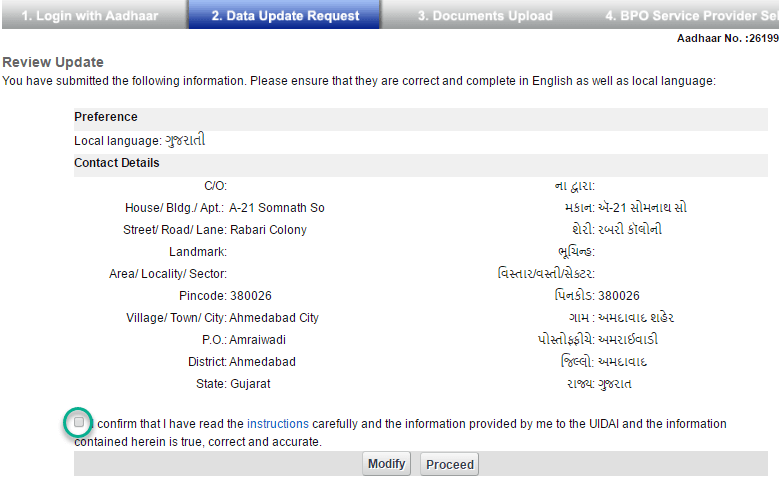 UIDAI said now you cam only update address online. For other data like name, DOB, mobile you have to visit aadhaar center. Can any family member go to update or I need to go since i’m out of state? No, you need to visit aadhaar center. Now Bank also provides this facility so you can visit bank also.